San Salvador, El Salvador – Alex Gonzalez decided to flee El Salvador on the spur of the moment. Waking up from a recurring nightmare about gang violence, Goncalez packed a small bag and left home that day, joining the latest caravan of migrants and refugees heading north from Central America. The 22-year-old from the department of La Paz had so far managed to resist pressure to join his local street gang, but when the gang started to ask him for protection money he could little afford, he made up his mind to flee. On Wednesday morning, he met up with 200 people departing from the capital city of San Salvador. Earlier this week, thousands of Hondurans had also headed towards Guatemala in an attempt to reach the United States. “We are leaving a lot behind,” Gonzalez told Al Jazeera. He was travelling with his 20-year-old brother, Jose. Leaning against a Spiderman backpack filled with a handful of clothes, Gonzalez took out his phone to show photos of his six-month-old daughter, Ashley Elisabeth. Unlike his brother Jose, who had been unemployed for three months, Gonzalez had regular work, as he was a clown for hire for special events. But he said that the threats and extortion had become unbearable of late. He made around $230 a month, roughly on par with El Salvador’s minimum wage, but the Mara Salvatrucha, or MS-13 gang, would take $150, and make menacing phone calls when he failed to pay. He planned to request asylum in the United States, where his 17-year-old sister was also an asylum seeker. She’d fled their home about two years ago, fearing for her safety after she was raped by what she said were gang members. Gonzalez was also worried about the rest of his family, especially his daughter. Unlike Gonzalez, 48-year-old Rafael Guillen from San Martin wanted his three children to be able to stay in El Salvador and receive a good education. He said he would only live in the US on a temporary basis, and just saw it as a way to earn more money. A street vendor in El Salvador, he hadn’t received any threats from street gangs himself. But as he went from bus to bus selling sweets and biscuits, he constantly had to think about not getting caught in clashes between rivalling gangs. The caravan was the fifth to leave El Salvador since last October. The majority of participants cited the lack of economic opportunity and insecurity as the reasons for leaving. Many hoped that travelling in large groups would make the journey safer and help offset the cost of people-smuggling fees. According to surveys conducted by the International Organization for Migration, these could be up to thousands of dollars. Some hoped to stay and work in Mexico, while others planned on joining the thousands of Central Americans already at the US border awaiting their turn to apply for asylum. Government statistics based on interviews with deportees pointed to economic factors as the overwhelming driver of immigration from the country, followed by insecurity and family reunification. But rights groups said causes of migration were often not clear cut and that a lack of government support for victims of violence had contributed to an upswing in the number of Salvadorans seeking asylum in the US and other countries in recent years. The UN refugee agency UNHCR reported that 49,726 Salvadorans requested asylum in the US in 2017, a more than eightfold increase from 2013. Salvadoran asylum requests in Mexico and Costa Rica were also on the rise. If you leave your house (in El Salvador), you run the risk of not returning. If you migrate to another country, at least if something happens, you die in the attempt. Jose Martin, from San Luis Talpa, hoped to make the case for asylum in the US. The 18-year-old, who identified as trans, said discrimination against the LGBT community made it difficult to find work. And threats of violence were constant. “I’m going to see if I can request asylum and not get deported, because if I come back, it’ll be to die,” said Martin, who had a trans friend who was murdered two years ago. As one of the most violent countries in the world over the past decade, El Salvador’s rate of people driven from their homes due to violence and conflict – 3,600 out of every 100,000 inhabitants – is second only to Syria, according to the International Displacement Monitoring Center. Tough-on-crime policies due to a crackdown on violent gangs have failed to improve security over the past 15 years. A total of 235,708 people were forced to move in 2018 to escape threats or violence in the country of 6.3 million, and six out of 10 internally displaced people have considered leaving the country, more than half of them with eyes set on the US, surveys by the University Institute of Public Opinion at the Jose Simeon Canas Central American University in San Salvador found. Climate change also increasingly drives migration from parts of El Salvador along Central America’s drought-prone Dry Corridor, which also stretches across Honduras and Guatemala, as farmers suffer crops losses amid years of intensifying droughts. 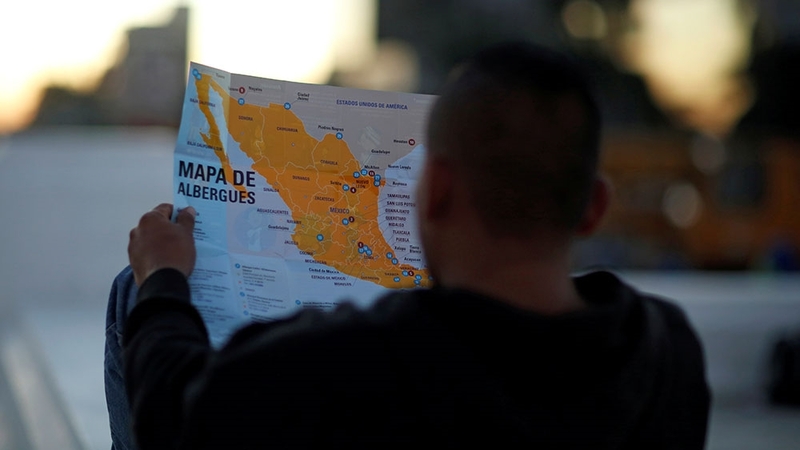 Of some 2,700 Salvadorans that left the country in four caravans late last year, nearly 600 returned home, Aquiles Magana, head of El Salvador’s National Council for the Protection and Development of Migrants and Their Families, told Al Jazeera. Magana said the government sought to educate people about potential dangers on the migrant trail, especially for young children, to make them think twice about joining the caravan, but few change their minds. “If they decide to go, we can’t stop them,” he said. “What good is it for the government to try to stop us if it isn’t giving us any [support]?” said 23-year-old Abigail Perez, as Wednesday’s group began their journey north. Travelling with her partner, Franklin, and their two-year-old daughter, Perez hoped to save money in Mexico before the family headed to the US. The caravan departed after government officials from El Salvador, Guatemala, Honduras, and Mexico met in San Salvador on Tuesday to discuss a regional development plan aimed at stemming migration through job creation and improvements in security in the Northern Triangle and southern Mexico. Mexican President Andres Manuel Lopez Obrador has called for an investment of $30bn to support a so-called Marshall Plan for Central America. Critics argued the strategy, which so far included no significant new investment from the US, was likely to favour militarised security initiatives and private investment schemes that historically have failed to improve the living conditions in the region. 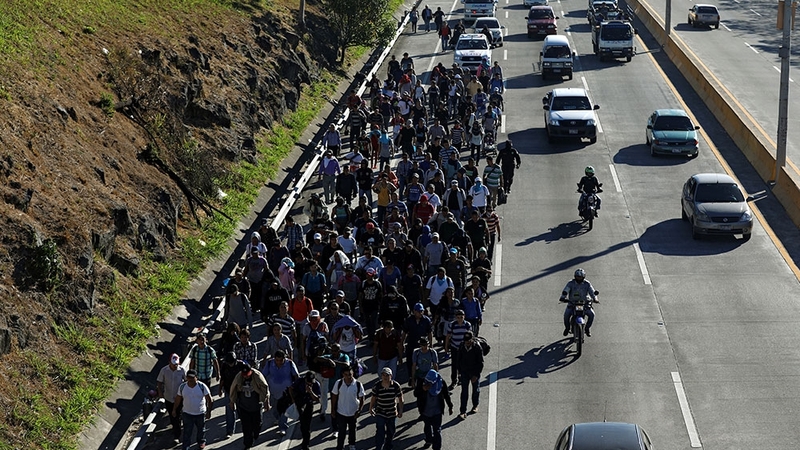 Ursula Roldan, director of the Institute for Research and Social Projection on Global and Territorial Dynamics at the Rafael Landivar University in Guatemala City, told Al Jazeera she was “alarmed” that mass migration continued amid uncertainty over how immigration authorities would receive the caravans, including in Guatemala, currently pitched in a constitutional crisis.